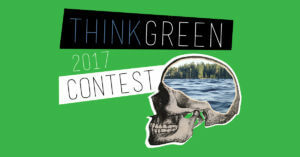 The fifth annual “Think Green” Contest has ended! On Saturday, April 29, we announced our winners handed out prizes to these lucky students. Each year, we’re overjoyed to see the look on the kids’ faces as they accept their awards, and tell us more about why they entered the contest. We wanted to take a moment to recognize both our winners and our runner-ups from the 2017 contest. Your creativity continues to amaze us! 1st First Place High School – Matthew Schork, Temecula Valley High School. Awarded $500 for his essay on how the district can save money and energy by “going off the grid” with solar solutions. Matthew is a three-time winner! 1st Place Middle School – Jaden Whitson, Temecula Middle School. Awarded $300 for his essay and poster presentation on using a subterranean coal plant and an aboveground carbon dioxide greenhouse to produce more energy, while helping the ozone layer. 1st Place Elementary School – Beau G. Ritter, Tony Tobin Elementary School. Awarded $200 for his essay and picture presentation of using donated or home grown fruits and vegetables to make energy. Beau is a two-time winner! RighTime Home Services first partnered with the TEF in 2013 when the “Think Green” Contest originated as a way to give back to the Temecula Unified School District, raise awareness about energy conservation and encourage students to recognize the impact they can make on our environment. Each year, the students have fully embraced this challenge by bringing fresh and creative ideas to the table, and the submissions this year were no exception. To learn more about RighTime Home Services and the “Think Green” Contest visit us at https://www.rightimehomeservices.com or give us a call at (951) 643-0492.